Tom De Haven is the author several novels, including It’s Superman! (Chronicle Books, 2005), Dugan Under Ground (Metropolitan, 2001); Derby Dugan’s Depression Funnies (Henry Holt, 1996); Sunburn Lake (Penguin, 1989); Funny Papers (Viking, 1985); and the cult classic Freaks’ Amour (Morrow, 1979). 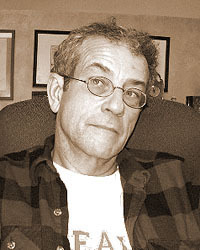 His novels for young adults include The Orphan's Tent (Atheneum, 1996) and Joe Gosh (Walker, 1989), and his graphic novels include Green Candles (Paradox, 1995). De Haven has worked as a freelance journalist, an editor, and a film and television scriptwriter. His book reviews have appeared in Entertainment Weekly and The New York Times Book Review. His awards include a fellowship from the New Jersey State Council on the Arts, and he has twice won fellowships from the National Endowment for the Arts. He is currently a professor of English at Virginia Commonwealth University.